After the devastating oil spill in the Gulf, BP has been looking for ways to improve their tarnished image and reputation. And, in a small town in south east Ohio, they may have found the perfect solution. This picture was taken last weekend in a small town outside of Cincinnati, Ohio. 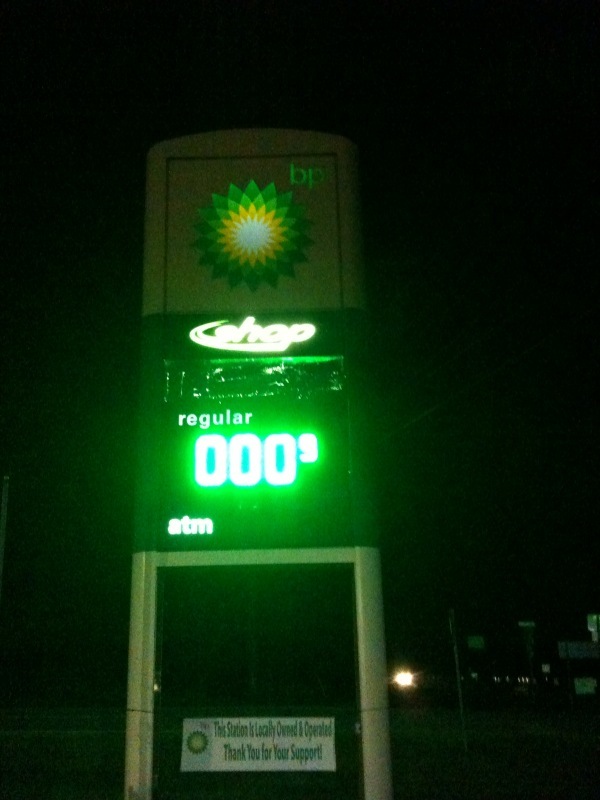 It has not been photoshopped or doctored in anyway (because I don’t have the skills for that…) It must mean either BP is struggling financially a lot more than we think they are, since they’re willing to almost give away their gas. Or, that they’re wanting their customers to return to them, even if it takes almost giving away gas to rebuild loyalty. Previous postFemoir headed to Indy Fringe! In a scientific financial dictatorship, like the one that exists in the USA, corporations set the rules, politicians serve the corporations like lapdogs, and government/private security personal are their muscle. This business model was coined by Max Keiser as the Casino Gulag Economy. If you do not know him, you should. http://www.maxkeiser.com. So why do governments play along? It is simple. Because corpo-fascist companies, like BP, control the money. BP has bought off politicians, scientists, local workers, and now the American people. Their motto is throw them a bone and they will love us again. As I sit here late at night with my windows open, while a soft rain and gentle breeze blows, I can only wonder if I am breathing in a toxic soup of corexit when I should be enjoying the moment. BP has ruined the Gulf Economy and risking the health of millions. And what does the US government do? Help them cover up the damage. I am more upset that the American people have tolerated this. Where are the protests? If this had been in a country like, oh say Greece, I guarantee that they would have run BP out of town and threatened government officials with their lives for aiding and abetting. Finally the mainstream media fails to report on a lot of this. The days of a good investigative journalism in the mainstream are long gone. All that they are now is the marketing arm of the Casino Gulag, reducing everything to sound bytes. Collectively they represent, an oft coined term, the New World Order. Their motto is that we are all useless eaters and that if it is not on TV then it does not exist. It is my mission in life is to wake people from their sleep and put some fire into their souls.